We are a leading Wholesale Distributor of basin mount sensor faucet, stainless steel sensor faucet, wall mount sensor faucet, automatic taps and sensor tap from Chennai, India. Our offered Basin Mount Sensor Faucet is an intelligent detecting faucet wherein water comes out once your hands get into the detection zone. Its self-open and close working enables non touch operations, which can prevent bacteria mutual infections. Additionally, its power-saving working mode promotes super low energy consumption. 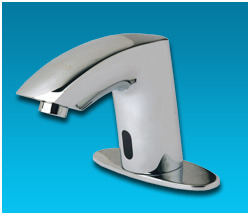 Our offered Stainless Steel Sensor Faucet is crafted with use of chrome plated brass body that looks attractive. This is enabled with low power consumption benefits with automated IR sensors for efficient use. Furthermore, its electronic control components are filled with resins and sealed to give moisture free life. 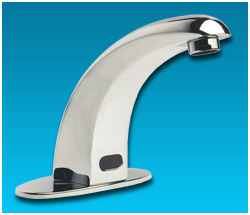 Our offered Wall Mount Sensor Faucet enables stylish looks and comfort to the basin area. Its splash-proof circuit control module and metal-jacketed wire protection for solenoid leads protects against water contact and other damage. Additionally, the sensor range adjustment makes it easy to change range for particular applications. Electronic control components are filled with resins and sealed by ultra sound process to give moisture free life. 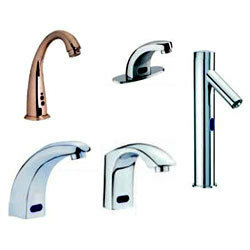 Our offered Automatic Taps are a complete package of smart looks and high on utility and performance. 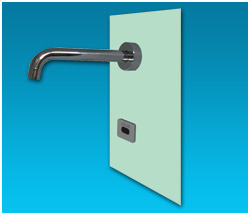 These are designed products to offer performance and maintain hygienic environment. Furthermore, our team keeps in mind the latest parameters that are prevalent in this genre of products. The cutting edge technology ensures high product quality, durability and design excellence.